Some places in guidebooks inevitably disappoint. Top shelf superlatives are tossed around recklessly and writers wax nostalgic about a magical scene that disappears at the first sight of pleated khaki pants and fanny-packs. Lalibela is none of this. Way up high in the mountains of Northern Ethiopia, the place is surreal. Churches hewn from the stone of the mountain hide below the ground while pilgrims in white and yellow cotton robes mill around the site. We were fortunate enough to arrive a few days before the Ethiopian Orthodox Christmas. The event draws pilgrims from all over the country. They stream in via airplane, car and foot. One group told us of how they trekked 8 days barefoot in order to reach Ethiopia's second holiest site. Yes, I felt lazy as heck after hearing this. But I still felt tired on our walk back to the hotel. Altitude! Blame the altitude! And the history of this place. Wow. As the story goes, Orthodox Christians were getting killed crossing North Africa and the Middle East on their way to Jerusalem. King Lalibela of Ethiopia decided to recreate Jerusalem in the mountains, in order to provide a site of safe worship. He had the 11 churches built below ground in order to prevent invading armies from discovering them. And it totally worked. The churches of Lalibela have been a site of continuous worship for more than 500 years. On our second morning, we got up early to catch the meditative sounds of the pilgrims moving along the paths towards the church, hymns and bells wafting from the stone. It was a magical picture as the robes converged up a single path towards the rock churches. On the last morning, I shed the comfort of a warm bed once more to catch the sunrise and morning prayer at Bet Giyorgis, the only church in the complex shaped to resemble a cross. Yes, taking photos has started to make me like mornings. The scenes were amazing and I was (for most of it) the only foreigner there, witnessing a pious event in its most raw and undistilled form. And it was beautiful. I could write so much more about this place. But I'll let the pictures do the talking instead. Pilgrims gather early in the morning to attend prayers at Bet Giyorgis. To say the churches are magnificent would betray the transcendent feeling you get being there early in the morning. The floors and walls of the churches are dotted with people deep in study. A group of young boys read from the Bible as priests sing around them. I'll skip the obvious metaphor. A priest awaits the pious as they stream in during to be blessed. I love this one. A stream of worshippers criss-cross down the path towards Bet Giyorgis. Wax candles are brought past a young priest at Bet Giyorgis. 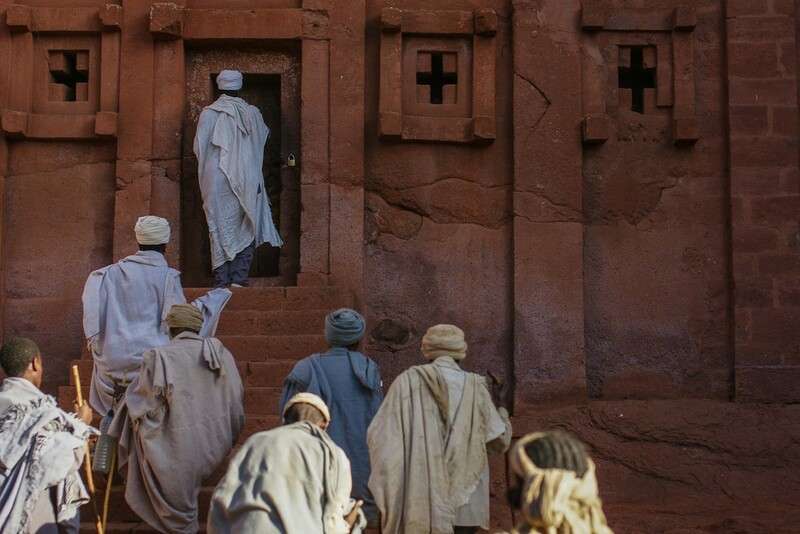 A priest leads pilgrims into one of Lalibela's 11 churches. The journey back to camp after a day at the churches. Many of the pilgrims sleep in the grass near the churches, with only a blanket and minimal supplies. I also love this one. Sometimes the fairytale-esque happen in real life.